Sept. 1 2010: we have moved to a new website! Please visit our new wiki hosted at the ugcs cluster on campus. The old aliases, http://alpine.caltech.edu and similar, now redirect to the new wiki. This page will no longer be maintained! Most of the material here has already been moved over to the wiki. "Encounters with Ents": a Floris van Breugel photography presentation at Caltech. Floris is a Caltech CDS grad student and an award winning photographyer. The presentation is Wed, April 28th at 7 PM at Beckman Institute Lecture Hall (which is NOT Beckman Auditorium). Pizza and drinks will be provided at 6 PM at the patio outside the institute. Please RSVP at the Caltech facebook page so we have a headcount for pizza (and you'll find more information on the presentation there too). April 2010: Thanks very much to Cascade Designs for supporting our club. Cascade Designs includes the MSR, Thermarest and Platypus brands. Much of our rental equipment is from a Cascade Design brand (e.g. all of our snowshoes). March 2010: we're gradually migrating our library from the Caltech Y to SFL. Here's a list of our books at SFL (or just do a "Subject" search for "Caltech Alpine Club Collection" or similar). Our old library page is still accurate, but we may stop updating it in 2011. Kenny Oslund has arranged a club retreat in Mammoth for March 25-29 (last weekend of spring break). Email him at kenoslund at gmail.com for more details. We are very grateful to Campus Life at Caltech for funding the majority of this trip! The annual (and perhaps last?) winter mountaineering trip is happening this year. Please see the 2010 winter mountaineering trip page for basic info, and subscribe to the google groups listed below if you plan on joining the trip. Links: Banff World Tour intro video on youtube (also, the high quality version). Interested in climbing Pico de Orizaba, the famous Mexican volcano? A few alpine club members plan to travel there over Martin Luther King weekend, Jan 15-20, 2010. You must be comfortable with ice-axe and crampon technique, and high altitude. For details, contact Pratyush at pt@caltech.edu. Update: Pratyush, Martin, Annelen and Karl had a successful expedition and have returned with all their fingers and toes. Wed Oct 7 '09: we had about 40 people turnout for our slideshow BBQ. Lot's of great stories. You can see a brief list of what was shown at the 2009 Slideshow Page. Update to Brett's record (see below): Brett has posted a John Muir Trail trip report on the backpackinglight.com forums. Also, Marc compiled his youtube videos into this Brett's JMT YouTube playlist (click "play all"). See also Brett's Summitpost JMT trip report. There's a new unsupported speed record for the John Muir Trail: 3 days, 14 hours and 13 minutes from Whitney Portal to Yosemite. Not only did this blow away the old unsupported record (from 2007) of 4 days, 5 hoursi (by Michael Popov), but it also beat Sue Johnston's supported record from 2007 of 3 days 20 hours. Who is this record breaker? It's our own Brett Maune, former Alpine Club president. Some of you know him from his time on campus; he was also on this year's winter Shasta trip (see pic, upper left), as well as the 2007 winter Whitney trip and the 2006 summer Shasta trip. Congrats Brett! He's in the process of writing a trip report, so maybe he'll post to the list when he's done. Until then, you can read a bit more about it at the following links (and be satisfied with the following quote): "What is this disgusting yellow crap I'm coughing up? Should I be concerned? My knees are also 'very' tight and painful. I can't really walk at the moment." Also: Peter Bakwin's "Fastest Known Times" website. Spring '09: There's now a Caltech Hiking Club with a nice website and a email list. Check it out! By popular demand, the club held it's 3rd annual Winter Mountaineering Trip. We had 25 participants on the February (2009) Mt. Baldy practice trip, and about a dozen participants on both the March Mt. Whitney trip and the April Mt. Shasta trip (via Casaval Ridge). See the webpage for details and pictures. Also, check out the 2008 and 2007 webpages (we climbined Whitney both years, and Mt. Sill in 2008 as well), or the Mt. Shasta trip page (from our summer trip in 2006). If you have ever wanted to get involved and help your fellow climbers/hikers/backpackers in need, Sierra Madre Search and Rescue (SMSR) is currently recruiting for the 2009 training class. Primary requirements are that you are at least 25 years old, live within 20 minutes of Sierra Madre, and are reasonably fit and comfortable in the wilderness. If you have any questions about the rewards or commitments involved in joining, don't hesitate to ask (email alpine and you will be forwarded to the appropriate person). We currently have several Caltech affiliated people on the team. 2nd Wednesday (and 3rd!) of every month is ladies' night at the Arc gym -- women climb free. New student rate of $35/month! For more details, and to see all past and future trips, please see our events page. Links: Film Festival intro video on youtube, and the World Tour intro video on youtube. Winter Safety Workshop, Sat Jan. 24 2009. Rob Klusman of Sierra Madre Search and Rescue will cover some basic winter topics, focusing on avalanche safety. This is NOT indended to replace a standard 3-day Level I AIARE course (if that's what you want, you should take the course in Bishop that JoHanna is organizing), but instead is an introduction to the subject. The workshop is from 9 to 4 at the Caltech Y's multipurpose room, on Saturday Jan. 24. Lunch will be provided. RSVP to alpine for lunch-planning purposes. NEW: here are the Winter Safety Workshop slides (converted to PDF format, 5.4 MB). This is for participants; for anyone else, it will be out-of-context. Do not rely on it! The table on page 63 didn't come out well, so here's the table in a separate single PDF file. Avalanche course in January 2009! If interested, email JoHanna at johannap and fill out our application (MS Word document) as well as SMI's Application/Waiver (PDF). More details on our Avalanche course website. Update, May 13 2008: The Student Investment Fund has funded our request for a portaledge! Much thanks to the SIF. Email alpine for details. December 2008: we decided the best use of the money would to instead buy two more pairs of snowshoes, and 3 more avalanche beacons. Because of this, the Winter Mountaineering trips in 2009 had a 100% beacon/person ratio. Thanks to the SIF! The long-lost Climber's Guide To The California Institute of Technology (3.8 MB PDF) has resurfaced! See also this old article profiling Caltech's climbers (1.5 MB PDF). Wilderness First Aid course, May 2008. The course is co-sponsered by the Caltech Y, and will be taught by instructors from the Wilderness Medical Institute of NOLS. The application period is over; due to constraints, only 30 participants are allowed. Sierra Winter Mountaineering Trip in February and March 2008. This involved four trips: two practice trips to Mt. Baldy in February (15 to 20 participants each trip), and then serious trips to Mt. Whitney and Mt. Sill in March (about a dozen participants for both trips). Avalanche Course, March 2007. Thanks to the Moore-Hufstedler fund's generous support, we organized a free avalanche course on March 23-25, 2007. The course was in Bishop, CA, taught by instructors from the Sierra Mountain Center. We had two weekends, with about 24 participants total. See the avy course page for more info. Mt. Whitney trip, March 2007. See the Whitney '07 trip page. We ascended the Mountaineers Route in early March 2007 with a group of 15 climbers after a few practice trips in February. The 2006 Banff Film Festival (2006 films, but shown in 2007) came to Caltech on Tuesday March 27th, 2007 at 7:30 PM in Ramo Auditorium. Here is the Caltech Public Events Banff Film Festival site, and information on obtaining tickets. There are 25 films on the tour; we had time for about 11 or 12 of these to watch (a listing of the films is on the public events website). Wilderness First Aid course, Oct. 2006. We hosted a wilderness first aid course, which was Fri. evening Oct. 13th through Sun. Oct. 15th, 2006. The course is co-sponsered by the Caltech Y and the Moore-Hufstedler Fund, and was led by instructors from the Wilderness Medical Institute of NOLS. See also our list of acronyms from the '06 WMI course. The Banff Film Festival came to Caltech on March 29th, 2006. Mt. Winchell trip page Oct '06. A moderate late-fall outing. Mt. Shasta trip page July '06. We tackled the giant Whitney Glacier on the N. side of Shasta over two days, navigating ice fields and crevasses. Backcountry.com has a deal with the Alpine Club for a variable discount on their products. Much thanks to Nick Stadie for organizing this, and to the folks at Backcountry.com. To use the discount, you must be a member on the email list; see the Feb 7th 2008 email for details. The club also has, or has had, arrangements with MountainSmith, Outdoor Research, and Evolv. We appreciate our sponsors! 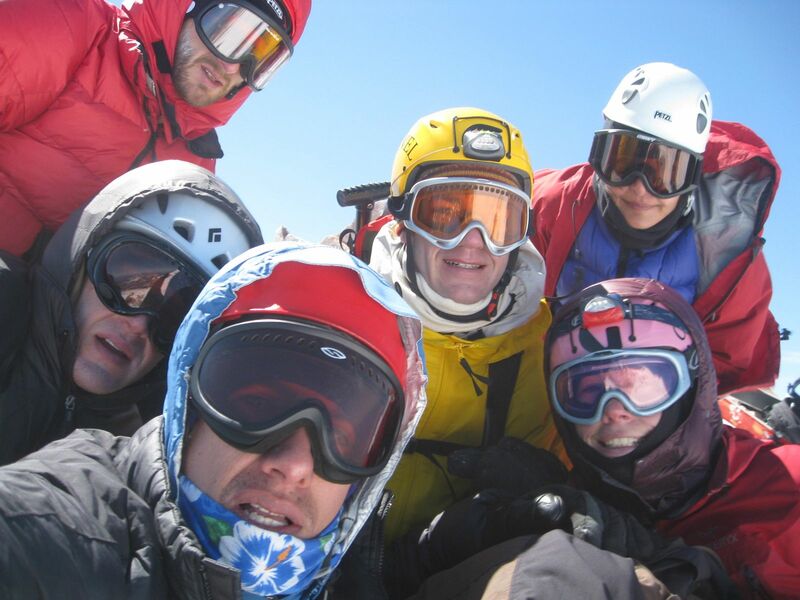 The Caltech Alpine club serves the entire Caltech and JPL community and is dedicated to all aspects of mountaineering. We have about 480 people on our email list, ranging from sport climbers to backpackers to cavers to alpinists. This website contains information on upcoming events, local climbing areas and places to buy and rent gear. We also have listed the modest amount of gear and books that we loan out free of charge to members. If you are new to the community or to this site, you might try joining our mailing list. For specific questions, please email alpine -- not to be confused with the email list, which is alpineclub (all email addresses end in @caltech.edu unless otherwise stated). About membership: for the past few years, we haven't charged dues, and hence there is no such thing as being an "official member" of the club. To be involved with us, join the email list and check this site for upcoming events. Mt. Sill, The Swiss Arete and description. N. Ridge of Lone Pine Pk, and description. Clyde Minaret, SE Face 5.8 and description. Mt. Dana, 3rd Pillar 5.10 and description. S. Face of Charlotte Dome and description. Some of the guides are still a work in progress. Much thanks to SP and the SMC for publishing these on the web! Members of the club can recieve a wholesale prices on Mountainsmith products. Contact alpine for details. Much thanks to Mountainsmith! The club has a few other prodeals -- email for details. Thanks to the Student Investment Fund (SIF), we have recieved $400 to buy new guidebooks in spring 2007. An updated list of all the books in our library will be posted once the books arrive. We have nearly comprehensive coverage of most SoCal destinations, as well as areas such as Bishop, Yosemite and Red Rocks. The SIF also funded our purchase of two ice axes and two pairs of crampons last year. ASCIT, the Caltech undergraduate association, will give the Alpine Club $220 next school year. We received $120 from ASCIT for '06/'07. Much thanks! Held Tuesday evenings at 7:30 at Hanger 18 climbing gym. If you'd like to be part of a carpool, email alpine. This class is normally held every quarter, and you can either be "in the class" (the teacher, one of the Hanger 18 employees, is great), or just climb on your own. Either way, there's a $40 / quarter fee (as of 2007).
. If you don't already have a Google account, you can still view the calendar here. Email alpine if you'd like permission to edit the calendar. Jan '08: Check out the new SkiAndBoard mailing list. Steve House takes less gear to Nanga Parbat than most climbers take to an indoor gym. Watch and learn as he discusses gear on youtube. High altitude causing brain damage? Worth reading. June 24 '07 -- LA Times: Where to stay overnight in Yosemite article. June 23 '07 -- it's mosquito season! Comparison of Insect Repellents, taken from this N.E.J.M. article. Also, many favorable reports about Permethrin impregnated clothing. Ice-axe self arrest video -- pretty good, but if you're not wearing crampons, you definitely should dig your feet in. New climbing gym in Arcadia as of late 2005: Arcadia Rock Climbing, aka "The Arc". $15 per day. Williamson Rock closed. See this message board or visit Friends of Williamson Rock for information on the situation. The SIF has been very generous to our club in years past but their 2009 club disbursement was later than usual and past without notice, so we were unable to put in a grant request this year. Thanks also to Public Events at Caltech for helping us once again show the Banff Mountain Film Festival in March. This is our main source of club revenue. © Alpine Club of the California Institute of Technology. Photographs on this site may not be distributed without permission of the photographer. Background photo copyright Stephen Becker.